Full of flavor, easy and delicious, this easy muesli – the Swiss version of overnight oats – is one of my current favorite breakfast recipes for summer. Just stir it up the night before and breakfast will be waiting for you in the fridge the next morning. How convenient is that? Muesli (also referred to as “Müsli” or “Müesli”) is a breakfast and brunch dish based on raw rolled oats and other ingredients like grains, fresh or dried fruits, seeds and nuts. It was developed around 1900 by Swiss physician Maximilian Bircher-Benner for patients in his long-term care facility. Muesli is similar to granola, but is unbaked so it doesn’t contain sweetener or oil. People enjoy it like they do granola (served with milk or sprinkled over yogurt) or they soak it overnight to create a cool, porridge-like consistency that’s particularly nice in the warmer-weather months. You can buy muesli ready-made in a packaged dry form, or you can make it yourself, which is what I like to do. The wonderful thing about this simple, healthy breakfast is that you can easily tailor it to your taste or mood or what you have on hand! Any combination of nuts, dried and/or fresh fruit would be marvelous! The right breakfast fuels me until lunch, so most days I make sure to give my body something it likes. The wrong breakfast — one with too much sugar and processed carbs — sets me up for a craving and binging roller coaster ride I’d just as soon avoid. I love breakfast and have learned through lots of trial and error that the best one for me includes some combination of complex carbohydrates, protein, and healthy fat. There are plenty of easy breakfast recipes calling for oatmeal, fruit, yogurt, eggs, cheese, and veggies out there. During the winter months I love to warm my belly with a bowl of oatmeal or serving of baked oatmeal. But summer can be a bit of a breakfast challenge, especially if you live in the desert like I do. My appetite withers, but fruit alone isn’t enough to sustain me. The important thing is to lighten up in your thinking. 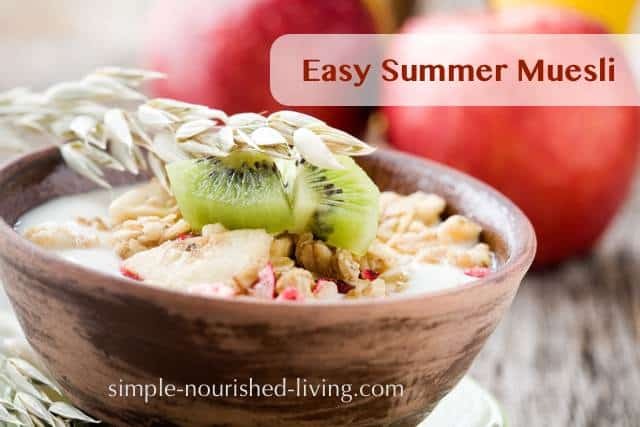 There are lots of easy breakfast recipes that are perfect for summer including some of my personal favorites – easy healthy smoothies, fruit and yogurt parfaits, magical healthy yogurt breakfast cream, healthy muffins, healthy blueberry muffins and healthy breakfast cookies, and homemade granola bars that can be made ahead or cottage cheese in a variety of ways. 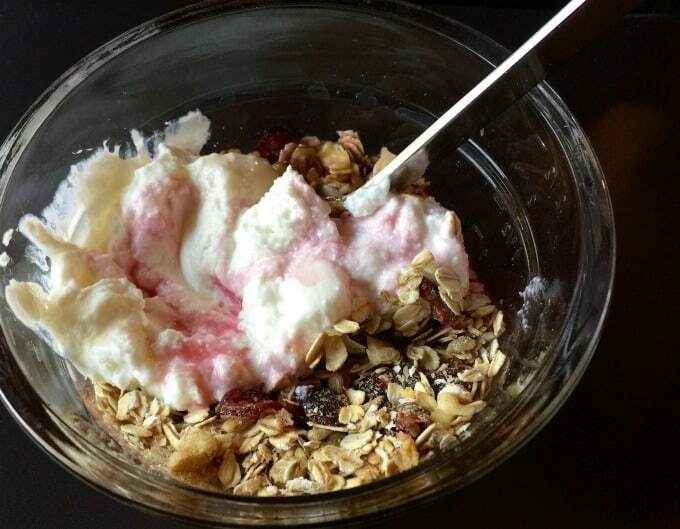 But ever since discovering overnight soaked muesli, it has quickly become a personal favorite. But it can be a bit of an acquired taste. If you like overnight oats, I think that you’ll love this easy summer muesli. You can also cook muesli on the stovetop like oatmeal—simply simmer it in milk or water for a few minutes. Or you can soak muesli in milk/yogurt/fruit juice or some combination overnight in the fridge and eat it cold. Come morning, the grains are soft and melt-in-your-mouth delicious. I usually thin it out with extra liquid and top it with fruit. Making your own muesli is SUPER EASY. Doing it yourself is also a lot cheaper and lets you customize your mix to your preferences. All you need is some rolled grains (oats or a mixed cereal ) and an assortment of nuts and dried fruits of your choosing—you don’t need a real recipe. All you do is dump some ingredients into a bowl, mix and store in a container. 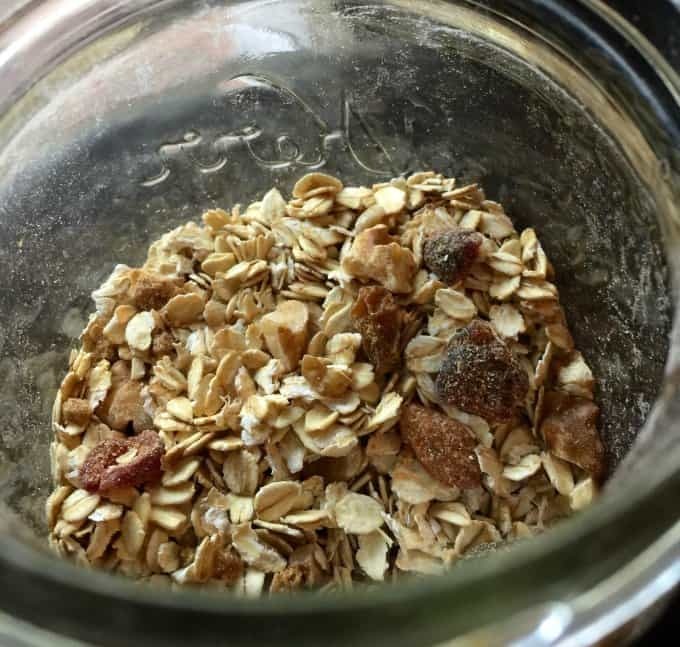 Using a basic ratio of 4 parts grain, 1 part nuts/seeds and 1 part dried fruit, you will have a batch of the best homemade muesli in a matter of minutes. 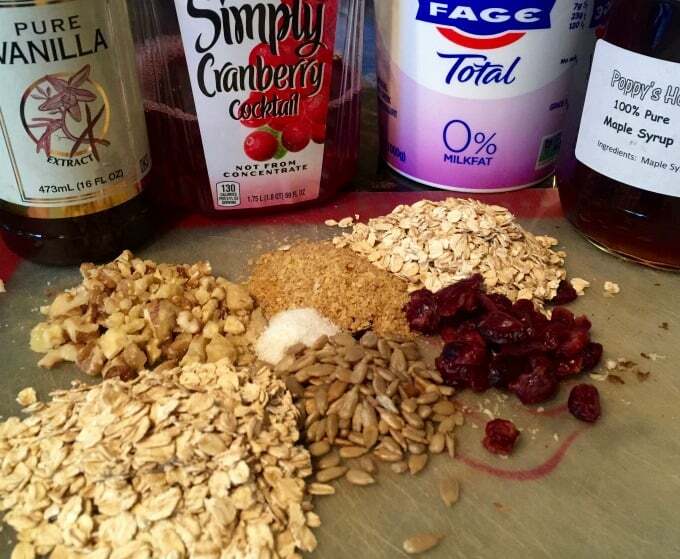 This recipe for easy summer muesli, is just an example of one way to mix together your grains, fruit and liquids. I often stir together a big batch of dry ingredients and store it in an airtight container. Then before bed I stir some together with an equal amount of liquid (yogurt/milk/juice or combination) and let it set in the refrigerator overnight. In the morning, breakfast is ready and waiting. This recipe has a little sweetness from the maple syrup and cranberry juice, which can be nice if you’re still acclimating to the lack of sugar in muesli. You could also try stirring in a spoonful of peanut butter, low sugar jam or a drizzle of honey instead. No almonds? Substitute whatever chopped nut you prefer. I used walnuts in this batch. No maple syrup? Substitute your sweetener of choice. Honey, low sugar jam, etc. No dried cranberries? Substitute the dried fruit of your choice, such as chopped dates or raisins. No cranberry juice? Substitute whatever liquid you prefer. Apple juice, milk, non-dairy milk, etc. Add grated apple to the mixture to make the original Bircher Muesli. 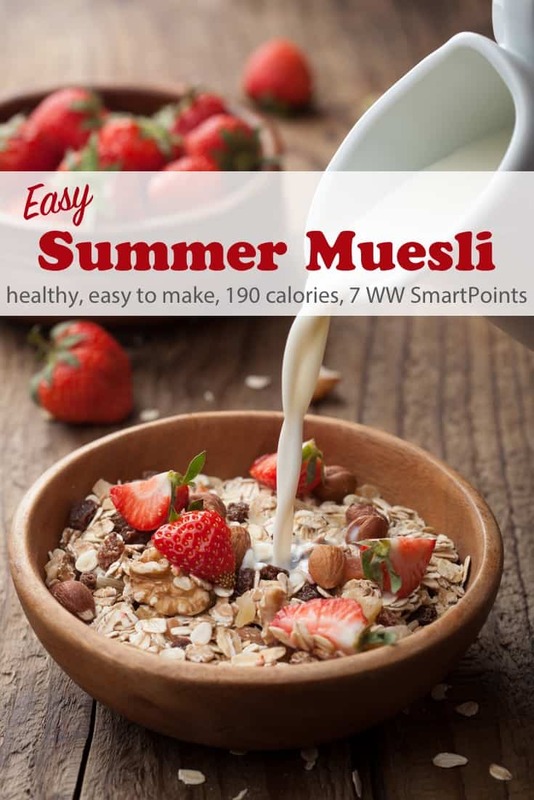 How Many Calories/Points in this Easy Summer Muesli Recipe? According to my calculations each serving (1/2 the recipe) has 190 calories and *7 WW Freestyle SmartPoints. It becomes *6 SmartPoints if you skip the maple syrup. Enjoy! 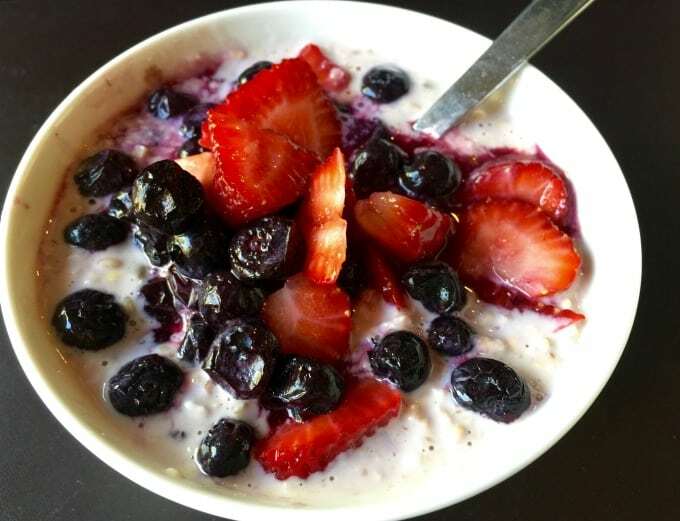 If you’ve made this summer muesli, please give the recipe a star rating below and leave a comment letting me know how you liked it. 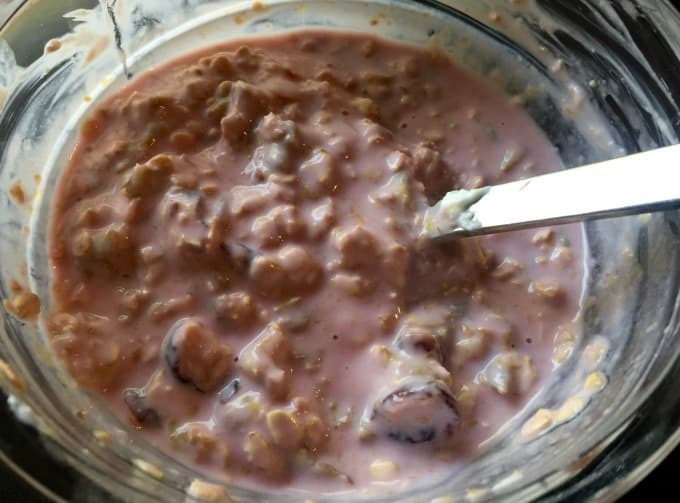 This easy healthy summer muesli - overnight oats with nuts and cranberries - is a great no cook breakfast for Weight Watchers. Use this recipe as a loose guide substituting whatever nuts, fruits and liquids you prefer. Combine everything in a medium bowl, stirring well. Cover and refrigerate for at least 8 hours and up to 1 day. Use this muesli recipe as a loose guide. Substitute whatever nuts, fruits, yogurt, milk or juice you prefer. Looking for more Weight Watchers Friendly Breakfast ideas? Thank for your blog. It’s great! looks yummy! Thank for your guiding! If I used nonfat yogurt, would it reduce the points? Hi Linda, I used plain nonfat yogurt to calculate the points and have updated the recipe to reflect this. To lower the points you could choose a non calorie sweetener and/or leave out one of the other ingredients with points: sunflower seeds, nuts or dried cranberries. Hope this helps.